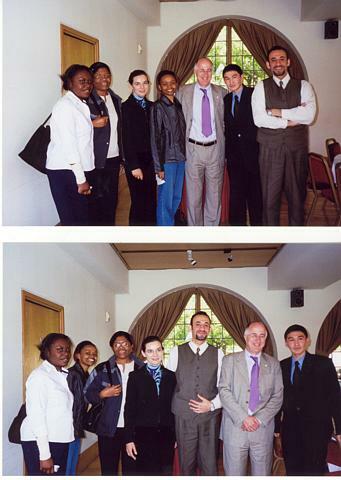 Chevening scholars in Glasgow participated in the Community Discussion on the British Foreign Policy hosted by Dr. Denis MacShane MP, Foreign Office Minister, at St. Mungo Museum of Religious Life Art, in Glasgow, on 8th July 2002.The forum was transparent, responsible and fruitful. Mutual communications took place on a variety of issues such as: British business overseas, tourism activities, relations with Europe and USA, poverty, NGO's, charities, political and social conflicts around the world, UK's role maintaining peace and human rights. Foreign Policy, as Dr. MacShane referred, is the heart of what British nation does do". Serious and important discussion was debated within the community. Chevening scholars contributed effectively and demonstrated their perception about the contemporary British foreign policy, with attempts to visualise its future. Dr. MacShane warmly welcomed the scholars and encouraged them to express their ideas and he was proud that such friends for the UK had been gained for life. A big 'thank-you' for both the Lord Provost's Office and the British Council in Glasgow for facilitating this opportunity. Furthermore, I extend gratitude to the Foreign Office's team who made that event successful.